Wi-Fi calling is a relatively new feature available on both iOS and Android smartphones alike. While this is great for the end-user, how will Wi-Fi calling impact the performance of your business's or organization's wireless network? 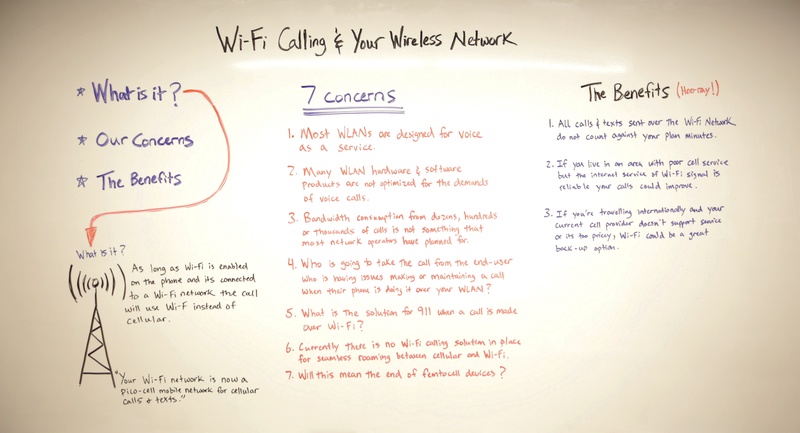 In today's Whiteboard Wednesday, Michael McNamee explains everything you need to know about Wi-Fi calling and your wireless network including: what is it, what are our concerns and what are the benefits of using it. Click on the whiteboard image above to open a larger, high-resolution image. Hi, my name is Michael McNamee. 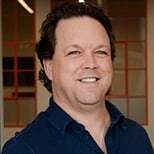 I'm a Senior Network Engineer at SecurEdge Networks. 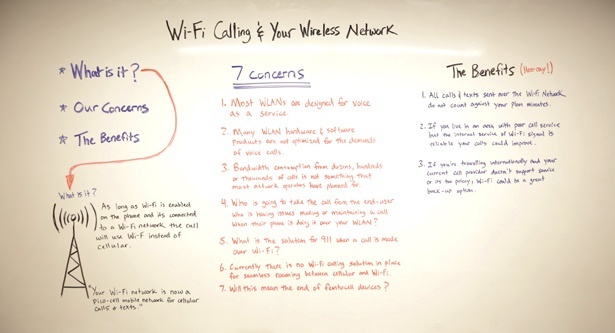 Today's topic of discussion is Wi-Fi calling and your wireless network. So for our topic today the discussion is, what is Wi-Fi calling, what are the concerns that we have with it and then, what benefits do we get by using it? So let's start off with what is it? Wi-Fi calling is the function or feature enabled on our mobile phones that transitions a call, or makes a decision to make a call, not on the cellular network, but on the Wi-Fi network. And that decision-making is generally made based on the strength or help of the cellular connection versus the Wi-Fi connection. If the cellular connection is poor and the Wi-Fi connection is healthy and strong, the mobile phone will make the call over the Wi-Fi network rather than the cellular. This feature isn't enabled by default on phones, it has to be manually enabled. But once the feature is enabled on the phones, the process is done automatically by the phone. The phone makes the decision on when that should happen. As with any new technology, we're going to have some concerns about the impact it's gonna have on our wireless networks. 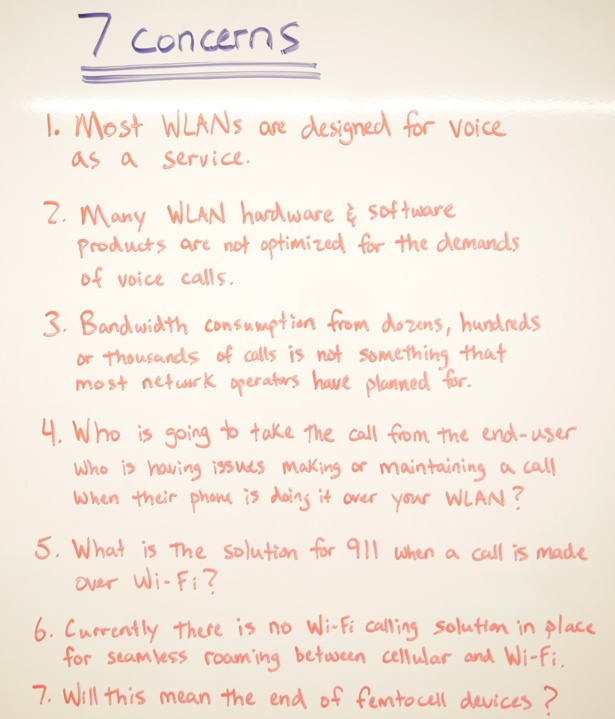 Specifically for Wi-Fi calling, we have some concerns and I've listed out about seven over here. The first one is that most wireless LANs were not designed for the voice spec. Voice is a service that has very specific demands on a network. Things like latency, jitter, number of APs, signal level. If the network is not up to that spec, the calls are going to be hard to maintain. The quality is going to be very poor. That leads me to a second concern we have is that a lot of the world's LAN hardware and software deployment wasn't designed for the voice spec. Specifically things like the small office. Home office equipment that some enterprises or even small businesses use, weren't developed or written to identify voice calls, and to give them quality of service and prioritization. In the long run, it's going to make it very difficult to maintain an optimal end-user experience when doing Wi-Fi calling. Another concern that we have with Wi-Fi calling with a wireless network is bandwidth consumption. Now, most voice calls are only going to consume about 64-96 kilobits per second. So that's not much, but if you take that and multiply it across dozens, even hundreds or thousands of calls, that extra data consumption or bandwidth consumption might be something that wasn't accounted for when the network was originally designed or implemented. So we could have a negative or profound effect on the performance of the network. We also have concerns with, who's going to take the call from the end-user if that Wi-Fi calling function doesn't properly operate. The cellular operator obviously is going to blame the wireless LAN operator. The wireless LAN operator is going to blame the cellular operators. The blame game continues and the end-user doesn't get any help with resolving their issue. 911 services are another concern with Wi-Fi calling over wireless networks. The default behavior of a 911 call made on a cell phone is for the cellphone to default to the cellular network for that 911 call. If the cellular network is not there and it has to go over Wi-Fi calling, 911 services sees the registered address of the phone. Typically, that's somebody's home or business address, but if they're at somewhere different than that home or business, it's going to be very difficult for 911 to know where to send the emergency responders to. Hopefully, the caller has the ability to tell them where they're at, but if not, that's going to be an issue. Roaming between cellular and Wi-Fi isn't currently there. There's no way to seamlessly hand off from a Wi-Fi call to a cellular, or vice versa. Hopefully, that will come in the future, but right now there's no way to support that. Then the last concern we have, or maybe this isn't really a concern, but kind of an assumption is that the femtocell, which were the small devices that the carriers would sell or provide the end-users, who have really low or poor cellular performance at their location, will potentially go away because now we've got Wi-Fi calling. 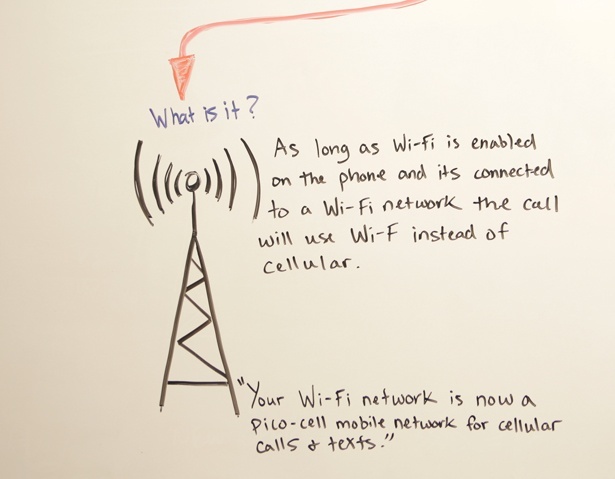 Wi-Fi basically creates an eco-cell for the cellular call to go over Wi-Fi. So we'll potentially see the end of these devices. Although we have concerns about Wi-Fi calling over wireless networks, there are some benefits to the technology or the feature. One of them is that all the calls and texts that go over the Wi-Fi network don't count against your cellular data plan on your mobile phone. Obviously, they'll go against your data limit or your potentially cap on your internet service for your home, but you're not going against your plan's text messaging or minutes or data plan. 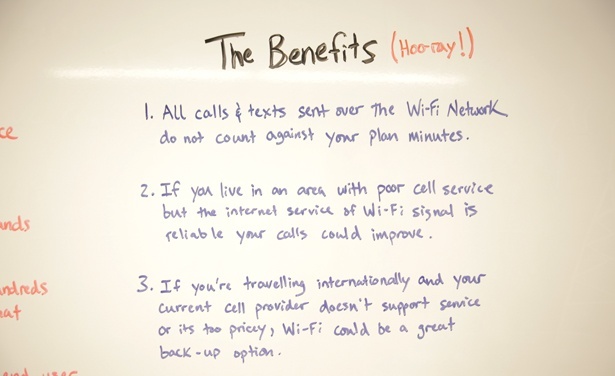 Another benefit is that, if you live in an area where you potentially have or historically have had poor cellular performance, if you've got a good internet connection at your home and you've got a good Wi-Fi network, your calls could potentially improve. This happens to be my case. We've had bad cellular reception in our home and now that we've got Wi-Fi calling enabled on my wife's Samsung phone, I actually notice that her calls are much clearer and they're more consistent and we don't have issues with dropped calls. I need to upgrade my phone to get this to one that's Wi-Fi calling enabled, so I can enjoy the same. Then the last is, if you're traveling internationally and you had challenges with roaming with your carrier plan, international travel could potentially get a little cheaper as far as your mobile phone goes. Some of the carriers have enabled Wi-Fi calling even when you're international, so if you're on a good Wi-Fi system in a business or hotel, or a school campus or resort, your calls can go over the Wi-Fi calling as well as your texts, and you're not having to pay some sort of international package from your mobile phone carrier. What to Look for in Part Two? Well, that's it for Wi-Fi calling over your wireless network. Today, we talked about what it is, the concerns that we have with it, and then what benefits do we gain from it. So hopefully this has got you thinking about what you're going to do to your network to make this new feature or service work for you. Stay tuned, in Part 2 of this Whiteboard Series, we're going to be talking about what changes or what features you're going to need to have on your network to make this work. Thanks again for watching and we'll see you next time. Michael is the Practice Manager of Security and Mobility at SecurEdge Networks. A true Wi-Fi “Guru”, he has an incredible ability at solving the most challenging wireless mess and then helping you understand it all.